ABBOTTSTOWN, PA, 6/29/2015 – Danny Dietrich took advantage of a little racing luck to start on the pole and lead every lap of round three of PA Speedweek on Monday night at Lincoln Speedway. 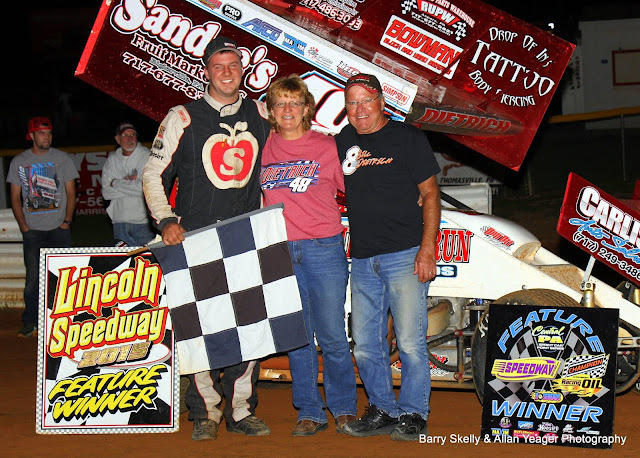 In doing so, Dietrich scored his third career PA Speedweek victory, third Lincoln win of the year, and moved alongside Stevie Smith with his 26th career win in the Pigeon Hills and claimed the $5,000 top prize. But he made it look easier than it was. Dietrich timed 11th quick in the 37-car field, but made it into the inversion draw when the second, third, and fourth fastest timers (Robbie Kendall, Freddie Rahmer, and Brandon Rahmer) failed to qualify in their heat. That, combined with Lucas Wolfe winning his own heat and drawing a “6” pill for the restart allowed Dietrich to start on the pole. Dietrich took the lead at the outside and drove to a comfortable lead before he hit lapped traffic ten laps into to the feature. That’s when Brian Montieth and Alan Krimes joined the chase. Both Krimes and fourth-starting Stevie Smith got by Montieth while the leaders raced through lapped traffic, allowing Dietrich to open a two-second lead with 10 laps to go. Once Dietrich disposed of pesky lapped traffic that held him up for ten laps, he drove away to a 2.72-second win over Krimes, with Smith crossing third, Montieth settling for fourth, and brother Billy Dietrich holding his own by starting fifth and finishing fifth. Although the last 29 laps went non-stop, there were two early red flags. The first came out at the start when Adam Wilt, Jim Siegel, and Steve Buckwalter call got together in turn four at the starting line. Kyle Moody also rode the inside guardrail and went to the pits to repair brakes. Siegel was also able to continue, but Wilt and Buckwalter were done for the night. Then on lap two, popular invader Brady Bacon got upside down in turns one and two. All drivers were uninjured. Sixth through tenth in the “A Main” were Lucas Wolfe, Aaron Ott, Brent Marks, Greg Hodnett, and Freddie Rahmer. Stevie Smith, who won the first two PA Speedweek shows at Williams Grove and Path Valley, left Lincoln with the Speedweek points lead (488), 41 points ahead of Dietrich. Third through fifth in Speedweek points after Night #3 were Wolfe (394), Hodnett (376), and Krimes (355). Heats for the 410’s were won by Wolfe, Ott, Danny Dietrich, and Chase Dietz, with Freddie Rahmer winning the B-Main. Fast time in time trials over the 37-car field was set by Lucas Wolfe with a one-lap time of 13.031-seconds (103.599 MPH). Lincoln swings right back into PA Speedweek action on Thursday night, July 2nd, with the Round 5 of the scheduled 9-race series featuring the 16th Annual Kevin Gobrecht Memorial with $7,000-to-win, in conjunction with BAPS Family Night. The All American Outlaws round out the evening’s racing action. Gates open at 5:30 PM, with time trials set to get underway at 7:30 PM. Then on Saturday night, July 4th, it will be special 3-division show of 358 Sprints, PASS RaceSaver (305) Sprints, and 600 Xcel Modifieds. Again, racing action gets underway at 7:30 PM, with gates opening at 5:30 PM. TIME TRIAL RESULTS – 1. 1-Lucas Wolfe, 13.031 (103.599 MPH); 2. 55K-Robbie Kendall, 13.205; 3. 88-Brandon Rahmer, 13.229; 4. 51-Freddie Rahmer, 13.231; 5. 8-Billy Dietrich, 13.250; 6. 51S-Stevie Smith, 13.255; 7. 21-Brian Montieth, 13.265; 8. 87-Alan Krimes, 13.315; 9. 99M-Kyle Moody, 13.338; 10. 27-Greg Hodnett, 13.356; 11. 48-Danny Dietrich, 13.362; 12. 59-Jim Siegel, 13.369; 13. 1*-Tim Wagaman, 13.380; 14. 25-Aaron Ott, 13.391; 15. 15-Adam Wilt, 13.399; 16. 44-Chase Dietz, 13.400; 17. 39-Tim Gladfelter, 13.423; 18. 99-Brady Bacon, 13.434; 19. 71-Ryan Wilson, 13.509; 20. 19M-Brent Marks, 13.511; 21. 07-Doug Esh, 13.524; 22. 11C-Cory Haas, 13.541; 23. 16-Gerard McIntyre, Jr., 13.559; 24. 17B-Steve Buckwalter, 13.578; 25. 35-Steve Owings, 13.579; 26. 5-Tyler Ross, 13.613; 27. 52-Austin Hogue, 13.621; 28. 14-Lance Dewease, 13.624; 29. 93-Sheldon Haudenschild, 13.632; 30. 23-TJ Stutts, 13.681; 31. 3B-Randy Baughman, 13.743; 32. 2W-Glenndon Forsythe, 13.752; 33. 21T-Scott Fisher, 13.831; 34. 33-Curt Stroup, 14.001; 35. 15M-Bobby Mazingo, 14.336; 36. 36D-Wayne Dadeto, NT; 37. 69-Shane Hoff, NT.